We are building on top our midterm project Memento. Memento is a pair of personal devices used between two friends or family members. For the final project, we have added a third component, a shape-changing object that will react towards the interaction between the two personal devices and represent the relationship journey. We are using Nitinol Wire (wire with memory muscle) to change the shapes of objects that will symbolize the status of the relationship. The idea is simple: I give my best friend one of these devices and i keep the other for myself. We keep the shape-changing sculptures on our desks or workspaces, and we carry around our little “sensor” eggs. Whenever we hang out or interact with each other, our sculptures grow and change. When we don’t hang out, our sculptures display that we haven’t seen each other in a while. Our interactions may change the sculpture in a variety of ways: when we talk a lot, our sculpture could make little sounds. When we both push the button when we’re together, there will be a visual hint sent to the paired device, and our sculpture could have elements or flowers “bloom” or a tree “grow.” And when we shake the device when hanging out together, the different levels of shaking inputs will enable different intensity of output of the device. When we both go to the same place, such as a cafe or a gym, the paired device will capture the same location information through beacon bluetooth and return visual hints. This is an ambient way for us to collect aspects of our friendships and display it in a fun and interactive way. What I love most about VR experience is that it’s actually an “experience” itself. Going to different applications with HTC Vive brings me to different realities. This is drastically different than web experiences where most of the website gives me similar experiences. On the web, we are mostly just absorbing or contributing information on the network. With VR, the focus with information (images/texts,numbers) is lessened by something that’s more grand, an overall experience. 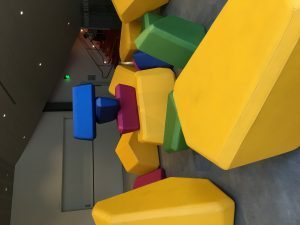 I would love to enhance/expand the experience of VR by making more connection with the physical reality, which is basically what Magicleap is trying to do, creating a mixed reality. The part of the experience I like the least is the headset, it makes my eyes and face sweaty and the wires would occasionally block my way. Making it wireless and making the headset less tangible would enhance the experience more. Also, if I pay a lot of attention to my peripheral sight then I can still gain a peak of the physical reality, which is distracting… removing such burden would also help the experience! For this assignment, I have connected to a weather API that would return the temperature of the city I’m searching for. I’ve made a list of cities in a list and a for loop that would request temperature for the cities every few seconds. The motor is attached to the sunny doll, however, my motor is currently broken so I can’t show the video here. I’ve attached the picture of sunny doll though. The concept is that if a city is hot the motor will spin the doll faster and spin it slower if it’s colder. Sunny doll is a popular item in Japan that people hang on the brink of their roof as a prayer of good weather. I’ve also connected arduino with processing that would make sine waves of warm/cool color based on the temperature. I’ve attached the video link as below. This is a thoughtless act I sometimes commit when I go to the rsf. Since there are so many different lockers sometimes it’s hard for me to remember which locker I’ve locked my bags with. So I would leave the tail of my backpack out for me to identify later. 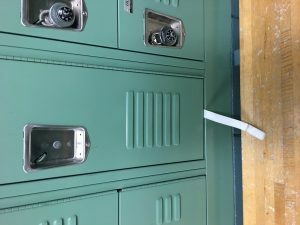 I think it’s interesting to share because it’s a pretty common problems for lots of people at the locker room and the lockers are not designed to be remember easily. This offers a new design opportunity.. The locker could have colors on them to go along with the numbers! I continued with what I made with my last lab. I want to incorporated music into the visual I made. So I worked on making Processing and Arduino to talk to each other by establishing a handshake between them. Now, I can use my FSR to control the gravity of the bouncing balls. And Processing will process the gravity values into 0 and 1 and feed it back to Arduino. Arduino will control the speed of the music. The music being played is Ode to Joy. The music will play slower when gravity is set to zero! 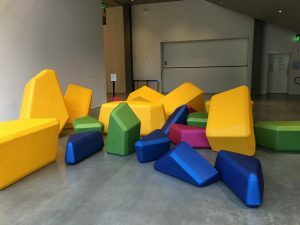 String portname =  "/dev/cu.usbmodem1411"; // or "COM5"
During my last visit to BAMPFA, I encountered this design space where numerous couches of different colors and shapes were placed on the floor to allow the visitors to move them around to create a different workspace. It was a very fun activity and the readings this week reminded me of this design. When we visit most offices, they layouts are usually static and offer no space for creativity. The initial design of the office will never change. However, this design space encourage people to make changes and new arrangements so they can become more comfortable with the space. 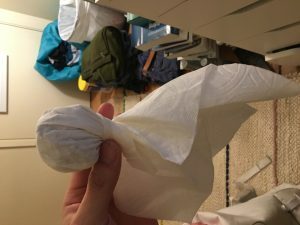 Such idea is a bit similar to strangely familiar where the people who experience the ordinary daily objects can make changes to them by creating a new experience with the same set of objects. I think this design allows me to think about things different and force me to think about how other ordinary things in life can be made more fluid so people have more control. One project that’s similar to such idea is Lego Phone, where people buy components to design their own mobile phone. Even though the project failed at the end but it was still a very fun experiment conceptually. I made a bouncy balls animation where the FSR can control the gravity of the bouncy balls. I’ve attached a youtube video. Music is accompanied with the bouncy ball experienced. Also I added features that will let users control the color of the balls through mouse and control the color of backgrounds through keyboards. The user can also control the spring of the balls through up and down keys. I didn’t focus as much on the mechanical part of the lab because I spent too much time playing with the animation and digging into the tutorial. Right now, I’m just controlling the force through my hands. But I definitely had a lot of fun playing with this lab and am looking forward to apply some mechanical concepts in the future. String portname =  "/dev/cu.usbmodem1421"; // or "COM5"
I’ve always been interested in technology that brings zen and calmness to people’s life. So the topic of calm design and ambient design really pleases me. A week ago, I stumbled upon a new technology named Muzo. Muzo is a state of the art vibration monitoring system that will turn everything into an acoustic environment with its own speed of sound. It blocks noises around you. There are three modes for different scenarios – Serenity, Sleep, and Secret. Each mode adjust your sound environment for the task you are performing. I wonder how the concepts of the reading can be related to the conceptual design of this device. The paper talks about that a calm technology is one that can move between center and periphery and making the user more attuned to the information instead of of being attended to. The Muzo does this not by moving back and forth from center and periphery, instead, it creates a new environment that becomes the center of your environment and wipe out the periphery noises that you do not want to attend to. This analogy might be similar to the clear glass window in the office space, in which you have your personal zen zone but you can still get minimal information from outside of the zone. Without this device, we are forced to work in an open office, but with it, we can now build a clear window that blocks noises! I think that’s probably why even on its kickstarter page it talks about clear window!